Hibernation is a state of extremely reduced physiological functions and a deep depression of CNS activity. We have previously shown that the histamine levels increase in the brain during hibernation, as does the ratio between histamine and its first metabolite, suggesting increased histamine turnover during this state. The inhibitory histamine H3 receptor has both auto- and heteroreceptor function, rendering it the most likely histamine receptor to be involved in regulating the activity of histamine as well as other neurotransmitters during hibernation. In view of accumulating evidence that there is a global depression of transcription and translation during hibernation, of all but a few proteins that are important for this physiological condition, we reasoned that an increase in histamine H3 receptor expression would clearly indicate an important hibernation-related function for the receptor. In this study we show, using in situ hybridization, that histamine H3 receptor mRNA increases in the cortex, caudate nucleus and putamen during hibernation, an increase that is accompanied by elevated receptor binding in the cerebral cortex, globus pallidus and substantia nigra. These results indicate that there is a hibernation-related increase in H3 receptor expression in cortical neurons and in striatopallidal and striatonigral GABAergic neurons. GTP-γ-S binding autoradiography shows that the H3 receptors in the globus pallidus and substantia nigra can be stimulated by histamine throughout the hibernation cycle, suggesting that they are functionally active during hibernation. These results show that the histamine H3 receptor gene is one of the few with a transcript that increases during hibernation, indicating an important role for the receptor in regulating this state. Moreover, the receptor is functionally active in the basal ganglia, suggesting a function for it in regulating e.g. dopaminergic transmission during hibernation. Hibernation is a physiological state characterized by extreme reductions in body temperature and metabolic rate that reduce energy expenditure during seasons of cold ambient temperature and food shortage. The brain of a hibernating animal is in a profound state of electrophysiological depression [1, 2], but nevertheless, its functional integrity is retained. Indeed, the hibernating central nervous system (CNS) maintains postural control as well as sensitivity to internal and external stimuli . During the hibernation season, animals enter repeated hibernation bouts separated by short intervals of euthermia. Entrance into and arousal from hibernation can be viewed as transition states between two distinct states of CNS homeostasis, namely the non-hibernating (i.e. euthermic state) state and the hibernating state. The question arises as to what neurochemical changes occur to produce the hibernating state. We have previously shown that the levels of brain histamine and its metabolite tele-methylhistamine are markedly elevated throughout the brain during hibernation . The increase in the metabolite levels surpasses that of the histamine levels, indicating a hibernation-related augmentation of histamine turnover. Furthermore, and importantly, we were able to delay arousal from hibernation by infusing histamine into the hippocampus of hibernating ground squirrels . These findings suggest an important role for histamine in hibernation, wherein increased activity of histamine-releasing neurons is an important component of the CNS mechanism that produces and/or maintains the hibernating state. This histamine-mediated control may be effected through actions on specific brain arousal systems  as well as more widespread control of neurotransmitter systems. Synthesis and release of histamine is controlled by histamine H3 receptors [6, 7]. The H3 receptor is an inhibitory, Gi/o protein-coupled receptor with both auto- and heteroreceptor function . The H3 receptor was recently cloned [9–11] and it was found to have several splice variants that are formed from the same gene [10, 12, 13]. Moreover, it has been shown to display constitutive activity, which plays an important role for the function of this receptor . The putative increase in histamine turnover during hibernation may be connected to the function of autoinhibitory histamine H3 receptors, and it is therefore of interest to look for hibernation-related changes in the expression and function of this receptor. The histamine H3 receptor may also be important for hibernation through inhibition of other neurotransmitters, as alluded above. In recent years, several studies have pointed toward a global depression of gene transcription and translation during hibernation [15–18], a phenomenon that may be crucial for the maintenance of homeostatic balance in periods of minimal supply of oxygen and nutrients. Depression of both translation and transcription in parallel with mRNA stabilization  should leave mRNA levels unchanged and, accordingly, brain levels of most mRNAs were shown to be unchanged across the hibernation bout . However, the mRNA levels of, for example, some immediate early genes were shown to increase in the brain at early arousal [16, 19], suggesting differential regulation of genes that are essential for controlling the hibernation cycle. Therefore, if histamine H3 receptors are important for hibernation, their expression should not be depressed. To test this, we did in situ hybridization, receptor binding and GTP-γ-S binding autoradiography to study H3 receptor expression and activity in the cortex and basal ganglia, where histamine H3 receptors are expressed at high levels [20–22], and compared data across the hibernation cycle. 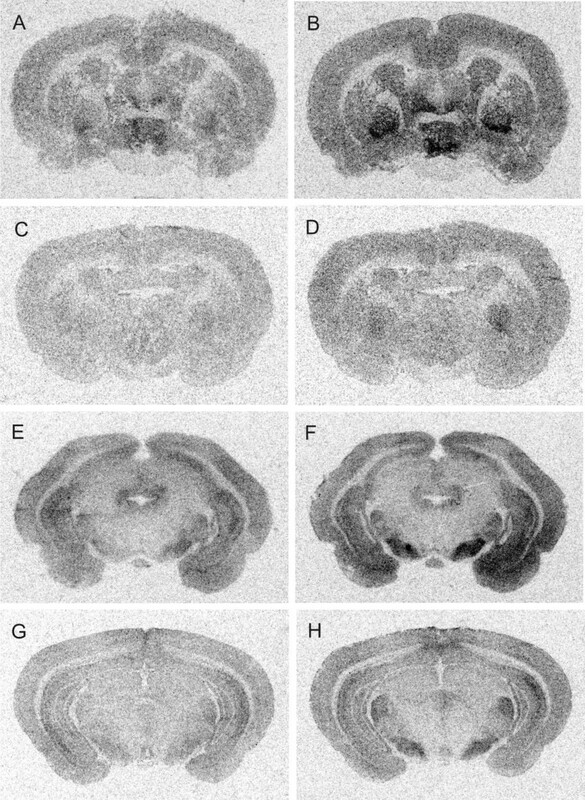 Among the areas of the ground squirrel brain included in this study, the histamine H3 receptor mRNA expression was highest in the cortex, caudate nucleus and the putamen, low in the globus pallidus and lowest in the substantia nigra (Fig 1A,1B,1C,1D,1E,1F). Two-way ANOVA showed that there was a significant effect of group (P < 0.001, F = 25.131) and a significant interaction between group and brain region (P < 0.001, F = 4.220), which led to further analysis with one-way ANOVA. One-way ANOVA showed that there was a significant difference between the groups in the cortex (P < 0.001, F = 16.030), caudate nucleus (P < 0.001, F = 15.260) and putamen (P < 0.001, F = 14.630), but not in the globus pallidus (P = 0.0751, F = 2.392) or the substantia nigra (P = 0.7113, F = 0.4593). Post-hoc tests showed that H3 expression was higher during hibernation compared to all other time points in the cortex (P < 0.001), caudate nucleus (P < 0.01) and putamen (P < 0.01; Figs 1A,1B,1C,1D,1E,1F, 2A). H 3 receptor mRNA expression and binding in euthermic and hibernating ground squirrel brains. 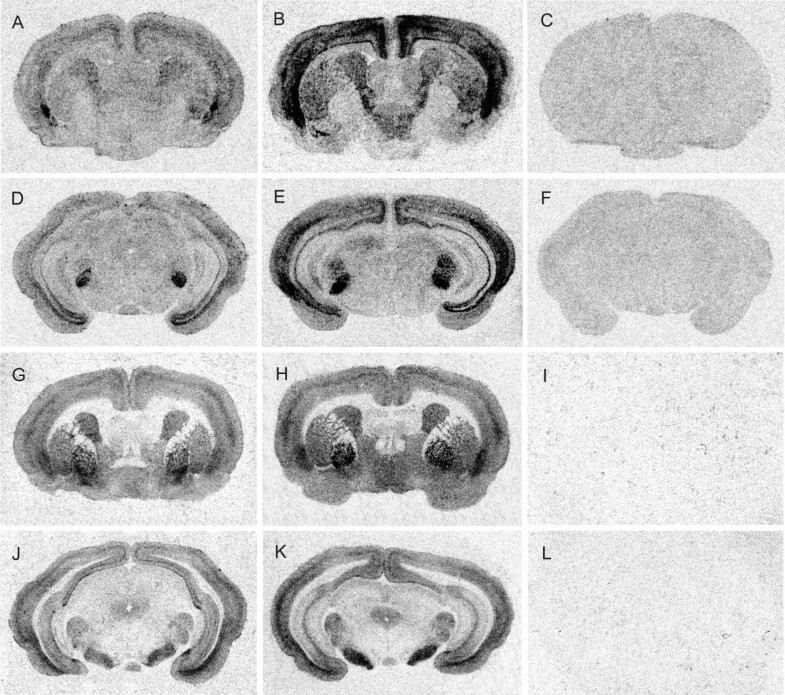 Coronal sections of ground squirrel brains showing H3 receptor expression revealed by in situ hybridization using [35S]-labeled oligonucleotide probe complementary to H3 mRNA (A-F) and [3H]NAMH binding to histamine H3 receptors (G-L). The H3 mRNA expression is higher in the cortex, caudatus and putamen but not in the globus pallidus and substantia nigra during hibernation (B and E) than during interbout euthermia (A and D). The signal was blocked with excess cold H3 oligonucleotide probe (C and F). [3H]NAMH binding to histamine H3 receptors is higher in the cortex, globus pallidus and substantia nigra during hibernation (H and K) compared to interbout euthermic brains (G and J). The specific H3 receptor antagonist clobenpropit completely blocked the [3H]NAMH binding (I and L). Comparison of H 3 receptor mRNA expression and binding across the hibernation bout. Graphs showing changes in A) H3 receptor mRNA expression and B) H3 binding in the ground squirrel brain across the hibernation bout. One-way ANOVA with the Bonferroni post hoc test. *P < 0.05, **P < 0.01., ***P < 0.001. Mid-interbout n= 5, end-interbout n= 4, hibernation n= 4, arousal n= 3. Caud = caudate nucleus, Put = putamen, GP = globus pallidus, SN = substantia nigra, pars reticulata, IOD = Integrated optic density. Error bars = SEM. In the ground squirrel brain, histamine H3 receptor binding was very high in the substantia nigra and the globus pallidus and high in the cortex, caudate nucleus and putamen (Fig. 1G,1H,1I,1J,1K,1L). Two-way ANOVA showed that there was a significant effect of group (P < 0.001, F = 11.265) and a significant interaction between group and brain region (P = 0.011, F = 2.170). Subsequently, one-way ANOVA showed that there was a significant difference between the groups in the cortex (P < 0.001, F = 7.343) caudate nucleus (P = 0.088, F = 2.206), putamen (P = 0.113, F = 2.010), globus pallidus (P < 0.001, F = 8.757) and substantia nigra (P = 0.002, F = 5.250). Post-hoc tests revealed that H3 binding was higher during hibernation compared to mid-interbout in the globus pallidus (P < 0.01). In the cortex and substantia nigra the binding increased already at the end of the interbout (P < 0.05) and stayed high during hibernation (P < 0.05 for cortex, P < 0.01 for substantia nigra) and arousal (P < 0.01; Figs 1G,1H,1I,1J,1K,1L, 2B). Non-linear regression analysis of [3H]NAMH binding in the cortex produced KD 3.03 ± 1.16 nM and BMAX 3.77 ± 0.71 IOD for euthermic ground squirrels and KD 2.27 ± 0.39 nM and BMAX 3.31 ± 0.26 IOD for hibernating animals. [35S]GTP-γ-S autoradiography is a technique suited for studying H3 receptor activation, because it preferentially reveals responses to Gi/o-protein coupled receptors [23, 24] and has been shown non-responsive to blocking of H1 and H2 receptors , which are coupled to Gq and Gs proteins, respectively. This was verified in our study, as application of histamine H1 antagonist mepyramine and histamine H2 antagonist cimetidine did not affect histamine-induced [35S]GTP-γ-S binding, whereas clobenpropit eliminated it (data not shown). The [35S]GTP-γ-S binding was high in the globus pallidus and substantia nigra, and moderately high in the caudate nucleus and putamen (Fig. 3). Analysis by two-way ANOVA showed that there was a significant effect of treatment (mid-interbout: P < 0.001, F = 50.275, end-interbout: P < 0.001, F = 148.028, hibernation: P < 0.001, F = 20.255, arousal: P < 0.001, F = 116.181) and a significant interaction between treatment and brain region (end-interbout: P < 0.001, F = 7.968; hibernation P = 0.006, F = 3.789; arousal: P < 0.001, F = 11.940). At mid-interbout the interaction was not quite significant (P = 0.058, F = 2.320). Further analysis with one-way ANOVA showed that histamine [35S]GTP-γ-S binding increased after stimulation with histamine in all brain areas at mid-interbout, end-interbout and arousal, but only in the globus pallidus and substantia nigra during hibernation (Figs 3 and 4; Table 1). Basal and histamine-stimulated [ 35 S]GTP-γ-S binding in euthermic and hibernating ground squirrel brain. Coronal sections of euthermic ground squirrel brains showing basal and histamine-stimulated [35S]GTP-γ-S binding to histamine H3 receptors. A and E show basal [35S]GTP-γ-S binding, whereas B and F show histamine-stimulated [35S]GTP-γ-S binding during the interbout euthermic state. C and G show basal, and F and H show histamine stimulated [35S]GTP-γ-S binding during hibernation. Basal binding is lower during hibernation (C and G) than euthermia (A and E). Comparison of the effect of histamine-stimulation on [ 35 S]GTP-γ-S binding across the hibernation bout. Graph showing [35S]GTP-γ-S binding after histamine-stimulation compared to basal [35S]GTP-γ-S binding in the ground squirrel brain across the hibernation bout. The basal value is set at zero. Student's t-test, *P < 0.05, **P < 0.01, ***P < 0.001. Mid-interbout n= 3, end-interbout n= 4, hibernation n= 4, arousal n= 3. Caud = caudate nucleus, Put = putamen, GP = globus pallidus, SN = substantia nigra, pars reticulata. Error bars = SEM. Comparison of basal and histamine-stimulated [35S]GTP-γ-S binding. Basal and histamine-stimulated [35S]GTP-γ-S binding (IOD) in the ground squirrel basal ganglia across the hibernation bout. Mid-interbout n= 3, end-interbout n= 4, hibernation n= 4, arousal n= 3. P = Student's t-test. Caud = Caudate nucleus, GP = Globus pallidus, SN Substantia nigra pars reticulata. In the present study we report an up-regulation of histamine H3 receptor mRNA in the cortex, the caudate nucleus and the putamen during hibernation. Moreover, we show a hibernation-related increase in H3 receptor binding in the cortex, globus pallidus and substantia nigra, and the receptors remain responsive to histamine stimulation in these areas throughout the hibernation bout. The increase in histamine H3 receptor mRNA is a very interesting finding in view of accumulating evidence of a global depression of gene transcription and translation into protein during hibernation. It has been shown that transcription ceases during hibernation due to depression of initiation and elongation, which is largely caused by the decrease in body temperature . Moreover, the rate of protein synthesis is reduced to only 0.04% of the rate in active animals  by a mechanism involving phosphorylation of elongation factor-2 . Translational initiation is uncoupled from elongation through both active suppression and passive depression, the latter due to low body temperature . The depression is reversed during arousal to permit gene expression during interbout euthermia . Parallel to the arrest of gene transcription and protein synthesis, mRNA is stabilized and the amount of polysomes is greatly decreased during hibernation , suggesting that the amount of mRNA should remain unchanged. This is supported by studies showing no difference in most mRNA levels between hibernation and euthermia , although some mRNAs show seasonal differences in their expression levels . However, both in the CNS [16, 19, 28] and in peripheral tissues [29–32] there is evidence for hibernation-related increases in the levels of specific mRNAs, and differential gene expression has been proposed to play an important role for the hibernating phenotype . The up-regulation of gene expression seems incompatible with the aforementioned global depression of transcription and translation, but may be explained by protein synthesis during interbout and by differential regulation during hibernation . Considering the minimal amount of fuel available during hibernation, it seems reasonable to assume that most genes would be turned off, whereas only the genes that are of utmost importance for hibernation would be worth the energy-consuming process of transcription. In this study we showed that histamine H3 receptor mRNA expression increased in the cortex, caudate nucleus and putamen during hibernation, suggesting that the expression of this receptor may be important for hibernation. Binding of [3H]NAMH to histamine H3 receptors in the cortex, globus pallidus and substantia nigra was also elevated, but this increase was not as high as for the mRNA levels. Histamine stimulation increased [35S]GTP-γ-S binding to H3 receptors in the globus pallidus and substantia nigra during hibernation, at a level that did not surpass that of euthermic brains. These data suggest that not all the mRNA is translated into functional protein and/or that there is a G-protein accommodation during hibernation. However, it is also possible that agonist binding to the H3 receptor could be affected by unknown factors connected to the hibernating state, which would consequently influence our binding results. Moreover, as our previous results suggest an increase in histamine release and turnover during hibernation, it is possible that, due to changes in H3 receptor function, more histamine would be needed to evoke an equally large response as during the non-hibernating state. Nevertheless, we have shown that histamine H3 receptors, the activity of which can be either histamine-mediated or constitutive, are functional during hibernation and may therefore be important in controlling this state. It is interesting to note that H3 receptor expression is decreased in the hippocampus, whereas the excitatory H1 and H2 receptors are increased . The expression pattern of histamine receptors during hibernation may reflect differential regulation of different brain regions. It is possible that histamine serves to excite areas like the hippocampus, which has been shown to display nearly continuous electroencephalographic activity throughout the hibernation bout and is thought to be crucial for maintaining the hibernating state , whereas it may down-regulate other brain areas through H3 receptors. In the ground squirrel brain, histamine H3 receptor was expressed at high levels in the cortex. 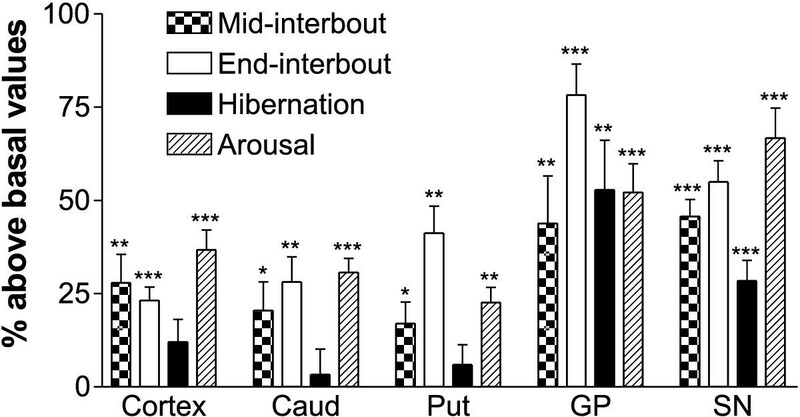 The levels of cortical H3 receptor mRNA increased during hibernation, whereas the receptor binding was increased from end-interbout through arousal compared to the mid-interbout levels. In the cortex, histamine did not evoke a significant response in H3 receptor GTP-binding activity during hibernation but did so at all other time points of the hibernation cycle. The high levels of cortical H3 receptor mRNA during hibernation may be a means of storing large amounts of message to be used for rapid translation during arousal, when the histamine H3 receptor may play an important role in controlling the release of the newly activated neurotransmitters. Lack of H3 receptor activity during hibernation, on the other hand, may contribute to increased histamine synthesis and release during this state. High levels of H3 receptor mRNA were expressed also in the caudate nucleus and putamen, but the globus pallidus had low and the substantia nigra very low expression. However, H3 receptor binding was higher in the globus pallidus and the substantia nigra than in the caudate nucleus and the putamen. This indicates that most of the H3 receptors in the caudate nucleus and putamen are expressed on the presynaptic terminals of GABAergic spiny neurons, which represent over 90% of the striatal neurons and project to the globus pallidus and substantia nigra . The H3 receptor mRNA detected in the globus pallidus and substantia nigra may also be located in GABAergic neurons. During hibernation the H3 mRNA expression in the caudate nucleus and the putamen increased, and consequently the H3 receptor binding increased in the globus pallidus and substantia nigra. The levels of H3 mRNA remained unchanged in the globus pallidus and substantia nigra. Stimulation with histamine increased GTP-γ-S binding in the globus pallidus and substantia nigra at all time points in the hibernation cycle, indicating that H3 receptors are continuously responsive to histamine in these areas. Inhibitory output from the basal ganglia is controlled by the direct and the indirect pathways . In the direct pathway, GABAergic striatal spiny neurons project to the SNr that in turn sends GABAergic projections to the thalamus. The indirect pathway consists of GABAergic projections from striatal spiny neurons to the external segment of the globus pallidus and from the globus pallidus to the subthalamic nucleus. Glutamatergic subthalamic neurons then project to the SNr. Activation of the direct pathway results in a disinhibition of thalamic neurons and activation of the indirect pathway results in an inhibition of thalamic neurons . Our present results indicate that histamine may control both the direct and indirect pathways through presynaptic H3 receptors on the terminals of striatal GABAergic spiny neurons in the globus pallidus and the SNr. During hibernation, movement is inhibited and our results suggest that histamine may contribute to this inhibition of movement through the action of H3 receptors in the basal ganglia. Although the expression of the histamine H3 receptor is high in the basal ganglia, the histaminergic innervation of these areas is comparatively low, suggesting that many of the H3 receptors present function as heteroreceptors rather than autoreceptors. These H3 heteroreceptors may play a role in controlling dopaminergic activity during hibernation. Histamine has been shown to decrease dopamine release in the rat striatum in vitro  and in vivo  through the action of H3 receptors. The histamine H3 receptor agonist immepip has been shown to decrease depolarization-induced accumulation of [3H]DOPA after inhibition of DOPA decarboxylase in the striatum, indicating that histamine inhibits dopamine synthesis through H3 receptors . Moreover, histamine attenuates locomotor behavior by reducing dopaminergic activity through striatal H3 receptors . As histamine H3 receptor mRNA is expressed at very insignificant levels in the substantia nigra pars compacta [13, 22], where the dopaminergic neurons are located, the effect of histamine is likely to be indirect. Indeed, it has been shown that histaminergic drugs do not directly affect the firing of nigral dopaminergic neurons but do so through the modulation GABAergic input to these neurons . Experiments on slices of the substantia nigra pars reticulata have shown that histamine H3 receptor activation inhibits the release of [3H]GABA . Analysis of striatal perfusates has revealed that extracellular levels of both free and conjugated dopamine increase during hibernation, whereas levels of the dopamine metabolites dihydroxyphenylacetic acid (DOPAC) and homovanillic acid (HVA) decrease . It was suggested that the increase in extracellular dopamine may be due to reduced degradation, caused by a decrease in catechol-o-methyl transferase (COMT) and monoamine oxidase (MAO) activity, as well as reduced re-uptake activity. Tissue levels of HVA have been shown to decrease already during entrance into hibernation [45, 46] and another dopamine metabolite, 3-methoxytyramine (3-MT) disappears altogether , indicating a decrease in dopamine release. HVA and 3-MT levels stay low throughout the hibernation bout and arousal from hibernation [45, 46]. Dopamine D2 receptors decrease during hibernation . The observation that dopamine release is reduced and yet extracellular dopamine levels increase during hibernation may reflect the changed needs placed on the motor system. Since active locomotion is not required, dopamine release (and presumably synthesis) is reduced. However, in order to maintain the functional stability of the striatal dopamine system components (e.g., prevention of receptor up-regulation, which would lead to supersensitivity in the motor system during and following arousal) and to maintain the postural control necessary to achieve the rolled-up posture of the hibernator, the dopamine degradative pathways are altered in order to maintain elevated extracellular levels of dopamine. In view of the studies indicating that histamine regulates dopamine synthesis and release through H3 receptor activation and our findings presented here showing that H3 receptors are active and perhaps upregulated during hibernation, we propose that histamine, through the action of GABAergic neurons, may play an important role in downregulating dopaminergic activity in the basal ganglia during hibernation. In the brain of mammals, histamine is released from a cluster of neurons located in the tuberomammillary nucleus of the posterior hypothalamus, sending widespread projections to almost all parts of the brain [5, 47–49]. Accordingly, the histamine H1, H2 and H3 receptors show widespread distribution throughout the brain [22, 50, 51]. The morphological features of the histaminergic system and the nature of its actions in the brain, i.e. the regulation of general activities, such as arousal state and energy metabolism, suggest that the histaminergic system may be a regulatory center for over-all brain activity . Along this line of thought, the histamine system would be well-suited to serve as a major controller of the hibernation bout cycle, as a single cluster of cell bodies projecting widely throughout the brain would allow a coherent, focused input to have a widespread, coordinating multi-functional effect. According to this model histaminergic tuberomammillary neurons could receive input conveying internal circannual information and peripheral stimuli, and relay output that affects different brain areas and transmitter systems in a differential manner, depending on the receptor constitution in the target area. In this way the histaminergic neuronal system could play a major role in introducing and maintaining brain homeostasis during the hibernation bout. Our previous results showing that histamine infused into the hippocampus prolongs the hibernation bout, suggesting that histaminergic neurons are involved in maintaining the hibernating state , together with our present data support this hypothesis. It is also noteworthy that tuberomammillary neurons contain GABA as well as histamine , and could thus be a source for GABA-mediated tonic inhibition of synaptic transmission. This study supports the idea that histamine may be a key factor in regulating hibernation, possibly by activating inhibitory H3 receptors. As there is increasing evidence for a global suppression of the transcription and translation of all but a few proteins, our findings suggest a significant role for the H3 receptor in the hibernating brain. It is possible that histamine exerts H3 receptor-mediated inhibition of dopaminergic transmission during hibernation. A putative role for histamine in hibernation may therefore be to regulate other neurotransmitter systems through H3 receptors, providing an important contributor to shifting the CNS between the hibernating and euthermic states and maintaining homeostasis during both states. Adult female golden-mantled ground squirrels (Spermophilus lateralis) were used in this study. Animals were housed in a dimly illuminated cold-room maintained at 6°C. Each animal was supplied with an open-topped wood box filled with cotton, from which the animal constructed its nest. Nest temperature, measured by a small thermistor probe within the nest box, was recorded continuously by a computer system to monitor the duration of the hibernation bouts. Animals were provided with food (rat chow; sunflower seeds) and water ad libitum. Animal experiments were approved by the University Animal Welfare Board at California State University, Long Beach. Sixteen animals were killed by decapitation, five at mid-interbout (i.e. the mid-point of the euthermic period separating the contiguous bouts of hibernation), four at the end of the interbout, four during mid-hibernation and three at mid-arousal. Mid-arousal was determined by a rectal thermistor probe inserted when the animal started arousing from hibernation. These animals were killed when they reached a body temperature of 20°C. The time point for sacrifice of the other animals was determined by calculating, for each animal separately, the length of the hibernation bout or interbout period based on the three previous ones, respectively. For saturation experiments six additional animals were killed, three in the hibernating state and three in the non-hibernating state. The brains were rapidly removed and frozen in isopentane. Cryostat sections (10 μm thickness) were thaw-mounted on poly-L-lysine-coated slides and stored at -70°C until use. The sections were collected in series and adjacent sections were used for in situ hybridization, receptor binding and GTP-γ-S binding. For in situ hybridization experiments an oligonucleotide probe designed to recognize guinea pig mRNA encoding the histamine H3 receptor was used. The sequence of the probe was AAG TCG GAG ATG GCG AGG TTG AGC AGA AAG AAG TTG TTC TGG GTG and it was chosen from a part of the mRNA that is common for all H3 receptor isoforms . The probe has previously been used for H3 receptor mRNA in the ground squirrel brain and was found to detect the correct transcript . Parallel hybridizations were run on guinea pig brain for verification of the signal. Normal hybridization mixture with a 100-fold excess of unlabeled specific probes was used for control. The hybridization procedure used has been described before [13, 50] and was used with minor modifications. The probe was labeled with [35S]deoxyadenosine 5-(-thio) triphosphate (New England Nuclear, Boston, MA, USA) at the 3' end using terminal deoxynucleotide transferase (Promega, Madison, WI, USA). Non-incorporated nucleotides were removed by purification through Sephadex G-50 columns. Prior to applying hybridization solution (107 cpm/ml), the sections were taken from -70°C, kept at room temperature for 10 min, and exposed to UV light for 5 min. The hybridization occurred in a humidified chamber kept at 42°C for 16 h. Posthybridization washes were carried out as described previously . Sections were exposed to Kodak BioMax X-ray films (Kodak, Rochester, NY, USA), and after that dipped in Kodak NTB2-emulsion (Kodak). Exposure times were 3 weeks on film and 15 weeks on emulsion. The method for histamine H3 receptor binding using [3H]-Nα-methylhistamine ([3H]NAMH) was based on previous publications [20, 54]. In short, tissue sections where incubated in 150 mM Na2/K phosphate buffer, pH 7.4, containing 2 mM magnesium chloride, 100 μM dithiothreitol (Sigma, St. Louis, MO, USA) and 4 nM [3H]-Nα-methylhistamine ([3H]NAMH; 81.5 Ci/mmol, New England Nuclear) for 45 min at room temperature. A concentration series of 0.4, 0.6, 0.8, 1, 2, 4, and 6 nM [3H]NAMH was used for saturation experiments. Non-specific binding was determined by incubating consecutive sections in the same medium in the presence of 5 μM clobenpropit (a kind gift from professor H. Timmerman). The sections were rapidly rinsed in ice-cold buffer and subsequently washed 4 × 2 min in fresh buffer. The slides were dipped into ice-cold water and rapidly dried under cold airflow. Tissue sections and tritium standards were exposed to tritium-sensitive film (Hyperfilm, Amersham International, Buckinghamshire, UK) for 6 weeks. The details of the protocol have been described previously [21, 23, 24, 55]. All incubations were performed at room temperature. In the preincubation step, slides were placed in a humidified chamber and incubated with assay buffer, containing 50 mM HEPES, 100 mM NaCl, 3 mM MgCl2, 0.2 mM EGTA and 0.2 mM DTT (all Sigma), pH 7.5 for 10 min. Then all sections were loaded with 2 mM GDP (Sigma) in assay buffer for 15 min. Agonist-stimulated activity was determined by incubation of slides in 40 pM of [35S]guanosine-5'-O-(3-thio)triphosphate ([35S]GTP-γ-S; New England Nuclear) with 1 mM of histamine and 2 mM GDP in the assay buffer for 2 hours. Basal binding was assessed by incubation of sections with GDP in the absence of agonist and non-specific binding was determined by incubation with 10 μM non-labeled GTP-γ-S (Sigma). Specificity of agonist-evoked [35S]GTP-γ-S binding was determined by addition of an appropriate concentration of clobenpropit in the GDP loading and in [35S]GTP-γ-S binding steps. Also, the histamine H1 receptor antagonist mepyramine and the histamine H2 receptor antagonist cimetidine (100 nM each; Sigma) were used to verify H3 receptor agonist-evoked [35S]GTP-γ-S binding. The incubation buffer was removed by aspiration; sections were briefly washed twice in ice-cold 50 mM HEPES buffer, pH 7.5, rinsed in ice-cold water and dried overnight under a stream of cold air. After drying, sections and 14C-standards were exposed to x-ray film (Kodak BioMax MR film, Kodak) for 2 days. Autoradiographic films were quantified by digitizing the film images with a computer based MCID image analysis system (Imaging Research, St. Catherines, Ontario, Canada) and by measuring gray scale pixel values. The relative optic density was converted to integrated optic density based on a standard curve derived from standards exposed to the films. Grey scale values were determined in the cortex, caudate nucleus, putamen, globus pallidus and substantia nigra pars reticulata from three to six sections, bilaterally from each animal, and the data were analyzed using two-way ANOVA. For H3 mRNA expression and binding the effect of group (mid-interbout, end-interbout, hibernation and arousal), and the interaction between brain region and group were tested. In the case of a significant interaction, one-way ANOVA was used to analyze the brain areas separately. The Bonferroni post hoc test was used to compare the groups with each other. For the [35S]GTP-γ-S binding the effect of treatment (basal [35S]GTP-γ-S binding and histamine-stimulated [35S]GTP-γ-S binding), and the interaction between brain region and treatment were tested with two-way ANOVA. If the interaction effect was significant separate Student's t-tests were performed for each brain region. To generate saturation curves for the H3 binding, non-linear regression analysis was performed using Graph-Pad Prism (Graph Pad Software, Inc., San Diego, CA, USA). Images were produced by scanning the films into a computer. This work was supported by the Academy of Finland, the Turku Graduate School of Biomedical Sciences, and the California State University, Long Beach. We thank Prof. H. Timmerman for providing clobenpropit. TS carried out the receptor binding study, performed all image and statistical analyses, and participated in the design of the study and in retrieving the brains. AL carried out in situ hybridization experiments and participated in retrieving the brains. OA carried out GTP-γ-S experiments. AB provided the hibernation expertise and housed and monitored the animals PP acquired funding, coordinated the study, and participated in its design. All authors read and approved the final manuscript.